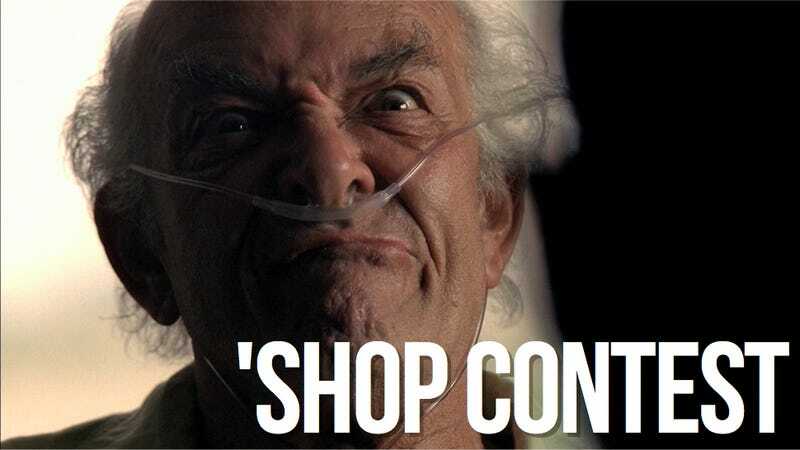 This week, the premiere date for the final season of Breaking Bad was announced (it's Aug. 11), and that's timely enough to for a mashup I've always wanted to see: Héctor Salamanca and video games. For those not in the know, (no spoilers) Héctor is a paralyzed, mute former cartel don who communicates by ringing a bell on his wheelchair or making crazy faces at the person talking to him. One ding for yes, two for no, typically. He forms complete sentences with the help of a nurse and a Ouija board or a grid of letters (as seen, quite memorably, in this sequence.) There was an awesome Héctor Salamanca twitter account out there, though it seems to be inactive. Still when that was going, getting a ding from him made one's day. So anyway, put this guy in a video game, or put a video game in Casa Tranquila (the old folks home where he lives) or do something with him for this week's 'Shop Contest. You can find scads of exploitables through Google image search. Just don't post any spoilers—those who are current on the show know exactly which one I'm thinking of—that's my only rule this week.